The Ames Shovel Works project recently received the National Trust for Historic Preservation Driehaus Preservation Award. Working with developer Beacon Communities and Architects Prellwitz Chilinski Associates, Halvorson Design is responsible for the design of 4 acres of open space within this 8.3-acre site. Adaptive reuse of the historic buildings and grounds features 113 residences, 1.5 acres of accessible public park space, a new wastewater treatment facility, and certified LEED Gold and Silver buildings. Ames Shovel Works, which once controlled 60% of the world market for shovels, was instrumental in the creation of the Transcontinental Railroad, Panama and Erie Canals, and the Statue of Liberty. Additionally, the Ames family gave millions to the Town of Easton and commissioned several works for the Town by such notables as H.H. Richardson, Frederick Law Olmsted and Louis Comfort Tiffany. Creation of the 1.5-acre public park included the restoration of the Oliver Ames Memorial that is located on site. Also, the unofficial town bell that signaled the beginning and the end of the work day at Ames Shovel was retrieved from one of the building cupolas and is proudly displayed as a feature of the park. An unexpected but fortuitous find was an enormous water wheel which once provided power for the factory before the Shovel Works converted to steam power. The water wheel and its original granite supports were restored and are featured prominently as a landmark focal point as one approaches the site from Main Street. The site houses a new wastewater treatment plant that not only serves the residential project but also provides much needed sewer infrastructure for the town core located in close proximity. As a result of the completion of this project, several new restaurants and shops have opened in the town core. The once desolate Main Street that in the past drivers sped through now requires drivers to slow down due to the revitalization of local businesses and the presence of pedestrians. It was understood that the construction of a new wastewater treatment plant and stormwater infiltration tanks would require displacement of tons of earth. In the midst of the site work process, the development team surprisingly discovered that the earth was much rockier than previously anticipated. A decision needed to be made: treat the rocky fill as a waste product and haul it away, cover it up, or treat it as a valuable resource and incorporate it into the site design. The design team chose to treat it as a valuable resource. The larger boulders were utilized as site features and seating elements. The mountains of crusty and dirty rocks were transformed into reclaimed ornamental mulch that serves as the predominant unifying element throughout the site, celebrating the craftsmanship of the original masonry factory buildings with its varied stone sizes and serving as a cue to the site’s regional identity and industrial nature of the factory. The design of the ground plane elements – the angular walkways and landscape areas – reinforces the dynamic nature of the industrial site as well as offers hints to the modern interior architecture and design. The sidewalk layout mimics the assembly line process, a manufacturing method used at Ames 50 years before the assembly lines of the Ford era. In this expression, lines converge at a node, and an action occurs at that moment, expressed in the colored concrete patterns at sidewalk intersections. The widening and narrowing of the sidewalks conveys a sense of compression and expansion as one walks through the site. In keeping with the historical significance of the site, the plant palette includes landscape plants that were used by the Olmsted Brothers at the nearby Rockery War Memorial. Common favorites such as dogwoods, shrub roses and viburnums were chosen, along with a few lesser-used ornamentals such as White Indian Currant (Symphoricarpus orbiculata). The use of showy ornamentals is limited in the landscape palette; the majority of the plant selections were chosen for their drought-tolerant and adaptive qualities. The landscape earned 5 credits towards LEED Gold and Silver certifications (certifications were awarded per building). 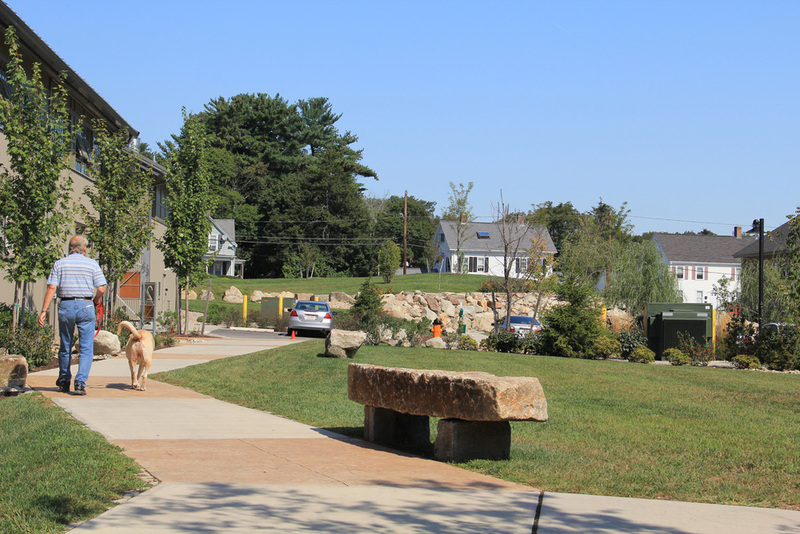 The historically sensitive yet contemporary landscape design ultimately saved construction dollars, reduced future landscape maintenance costs and helped to create an adaptive reuse community that once again is a great source of local pride for the Town of Easton. Halvorson Design's Atlantic Wharf project was recently featured on Landezine.com. Developed by Boston Properties, the project includes adaptive reuse of two historic buildings with a tower addition by CBT Architects. The vision for Atlantic Wharf extended beyond restoration of the historic architecture to include a reinvigoration of the waterfront, bringing active urban life to the Harborwalk and achieving ambitious sustainable objectives for the entire site. 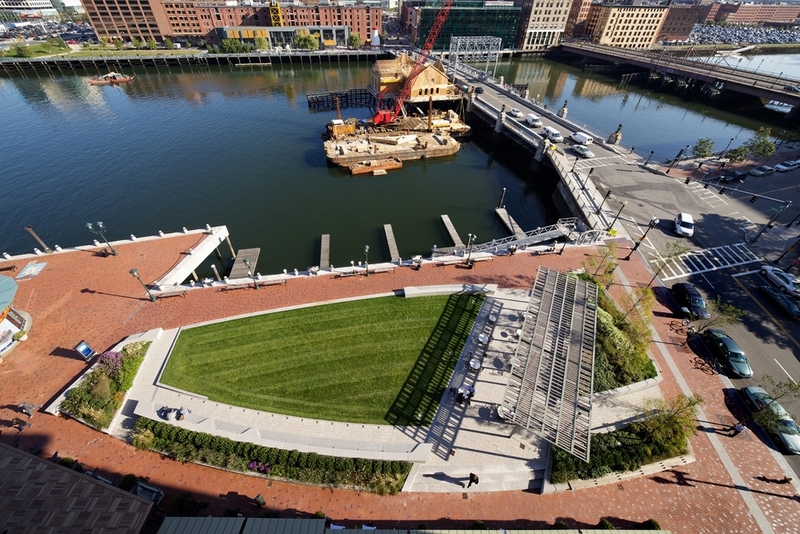 Halvorson Design is responsible for the Harborwalk, plaza, and vegetated green roof design. The grand opening of Halvorson Design’s open space at Neptune Road in East Boston honored the families who once lived in the neighborhood before the expansion of the airport altered the fabric of the community. The landscape embraces symbols of the neighborhood’s past, from cobblestones tracing the footprints of the original homes to interpretive artwork inspired by reminiscences of former residents. The project is part of an extended effort by Massport to provide open space for the benefit of East Boston residents. Joining the celebration were multiple generations of Neptune Road families. Thanks to Ecological Landscape Alliance for hosting our Boston Architectural College Green Alley Tour. Christian Simonelli from the Boston Groundwater Trust, Art Byers and Maria Bellata from the BAC and Jim Newman from Linnean solutions provided insights into this project and the monitoring systems. The Green Alley was designed by Halvorson Design and Nitsch Engineering and constructed by Valley Crest. Last night’s celebration of Janet Echelman’s aerial sculpture drew hundreds of visitors to the public garden designed by Halvorson Design Partnership on the Rose Kennedy Greenway. We are excited to see this beautiful and iconic work, entitled "As If It Were Already Here,” meld seamlessly with the landscape below. Yesterday’s groundbreaking of Shaffer Paper Park celebrated the highly anticipated transformation of the 15-acre former industrial site along the Neponset River. The design strategy, which includes efforts to remediate contaminated soils, restore ecological habitat, and create a neighborhood open space for the community of Dorchester, was a collaborative effort between Halvorson Design, the state Department of Conservation and Recreation (DCR), GEI Consultants, and DeRosa Environmental Consulting. Halvorson Design is excited to announce that the Channel Center Parks were selected for a 2015 Merit Award by the Boston Society of Landscape Architects! A list of all other award recipients can be found here: http://www.bslaweb.org/awards2015.html. 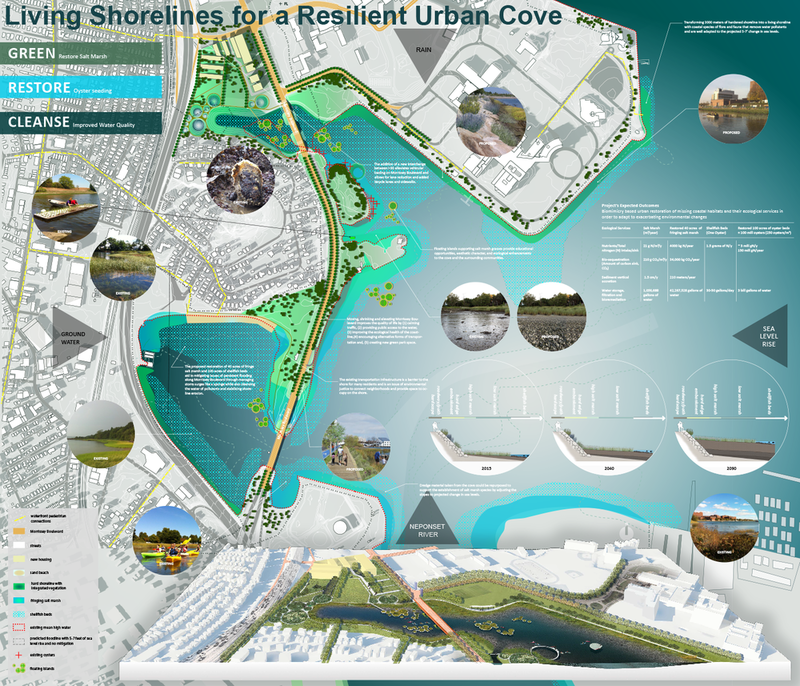 Halvorson Design is proud to have been part of the "Living Shorelines for a Resilient Urban Cove" submission team for Boston’s Living With Water International Design Competition. The submission received an honorable mention and is currently on display at the Boston Society of Architects.